Pictured is a Glock 19 in a PHLster Skeleton, Boxer Tactical Stryker Belt. About six months ago now, I was talking guns and gear with Jon at PHLsterÂ whenÂ he mentioned a new company he discovered sewing top quality tactical nylon gear here in the US, and at reasonable prices. Naturally, I was interested, and I contacted that company to see if they would like to submit a product for review. That company was Boxer Tactical, and that product was theÂ Stryker Belt. First, the name. As you can probably tell by the Boxer Tactical logo, Boxer refers to the dog breed, of which I am a big fan. Just because, here’s a picture my white Boxer named Maximus Decimus Meridius, or Max for short (dogs > cats in case you were wondering…yeah I went there). He’s a handsome fella. In addition to being dog lovers, Boxer Tactical believes in manufacturing quality and consistency, and doing so right here in the USA with what they call an Honestly American approach. Boxer Tactical believes strongly in American made products, and not just assembled in America. They take this very seriously, and prove it by being very transparent in their manufacturing process. The chart below shows where all materials used in their manufacturing process originate from. The Stryker Belt is a 1.75″ everyday use type of belt made fromÂ double-layered nylon webbing withÂ quintuple stitching to maintain rigidity. It has aÂ solid steel parachute buckle that is not only incredibly strong, but also very functional. The Stryker is extremely well made and very durable. I’ve been wearing mine several days a week (sometimes daily) for almost 6 months now, and aside from the normal wear on the hook and loop, it essentially looks brand new. The Stryker stiffness is what I would call mid-level. It’s not as stiff as some of the scuba webbing belts on the market, but I’ve found it to be plenty stiff enough. Some of the super stiff belts are great for range work and carrying a heavy load, but aren’t so great for all day comfort in my opinion. The Stryker belt strikes (horrible pun intended) a good balance between stiffness and comfort. While the Stryker belt makes a pretty good range/instructor belt (I wear mine to the range all the time), it makes a great concealed carry belt. This goes back to the aforementioned balance – it’s a comfortable belt that is sufficiently rigid for concealed carry. My typical concealed carry line up is a pistol in the appendix position, a reload and flashlight weak side, and some sort of blade strong side. At the range I typically go with an outside the waistband (OWB) Kydex holster strong side and an OWB double magazine carrier weak side. The Stryker belt is more than stiff enough for both of these load outs. As mentioned, the Stryker quality is outstanding. I’m no expert at sewing or sewing techniques, but I know a clean stitch when I see one, and the Stryker stitch lines are certainly clean. The buckle has held up very well, and still has no chips or damage to the finish. The photo to the right is my belt as of today after 6 months of wear, click for a larger view. The Stryker belt is also excellent value. At the time of writing, you could buy a Boxer Tactical Stryker belt for $45. An interesting note on purchasing – Boxer Tactical uses Amazon for their orderÂ fulfillment process. Since I shop on Amazon all the time, I think this is pretty cool. 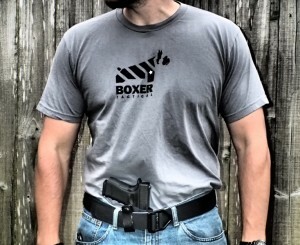 This model allows Boxer TacticalÂ as a small business to focus on what they do best – make gear. I can’t recommend the Stryker belt highly enough. Not only is it sewn in the US, but all materials are sourced here as well. It’s super high quality, has held up extremely well, and it’s very reasonably priced. You should probably buy two. I’ve been waiting for these to come out, thanks! 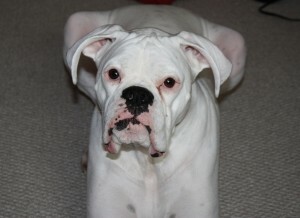 Your dog looks awesome by the way, I’ve never seen a white boxer before! A 1.75″ belt is too wide for most belt-loops. They need to make this in a 1.5″ size. Really? What belt loops have you found 1.75″ belts too wide for? 1.75″ fits all of my jeans, cargo shorts and tactical pants. Stop wearing your sisters pants.